A newspaper clipping from early on in GU history. Founded by Chris, Mark & Howard in April 2003, Goring Unplugged is a much-loved, totally unplugged music night in the heart of the beautiful Goring Gap in South Oxfordshire. We currently run Unplugged every couple of months. We love to encourage local talent (young and old!) 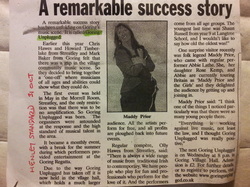 to play as well as more established acts such as Amy’s Ghost and Maddy Prior (Steeleye Span). Goring Unplugged is not a Folk Club, Jazz Club, Blues Club, or any club that defines the style of music performed. It’s an anything goes musical event. It is also a totally non profit-making event. Admission to non-performers is £4 per person. This is to cover the costs of hiring the Hall, lighting, and decorations, and we are licensed to allow you to bring your own food and drink (there is no bar). We do supply nibbles though! Co-founders Mark, Chris and Howard celebrate. 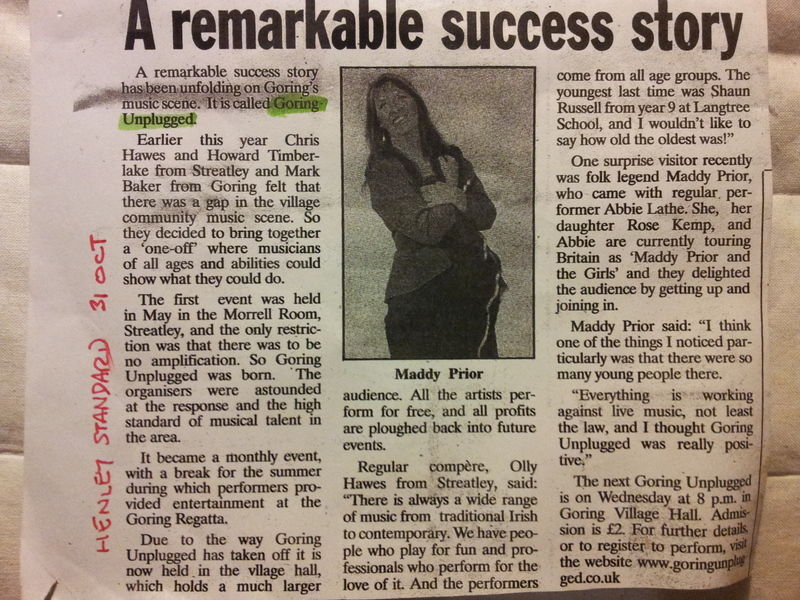 In April 2013 Goring Unplugged celebrated it's 10th birthday - an impressive milestone for any local event. It's a testament to all the volunteers who work so hard to keep Goring Unplugged ticking along so nicely. We look forward to many more years of totally unplugged acoustic music in the Goring Gap! © Copyright Goring Unplugged 2015.